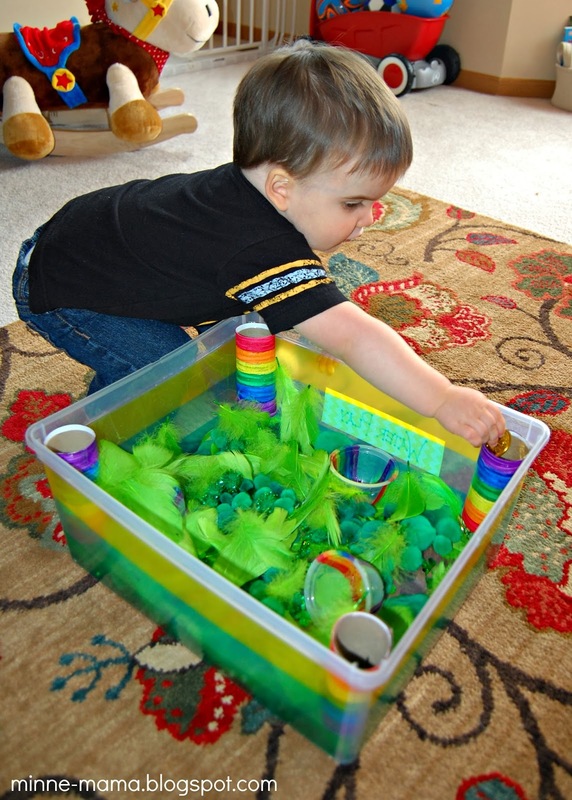 I usually try to make our sensory bins fairly simple, giving Skyler one type of filler to focus on, even though I will color them differently or put two of the same type of filler, but when I was trying to decide what filler to use for our St. Patrick's Day sensory bin, I envisioned an explosion of green, so that is what we did! 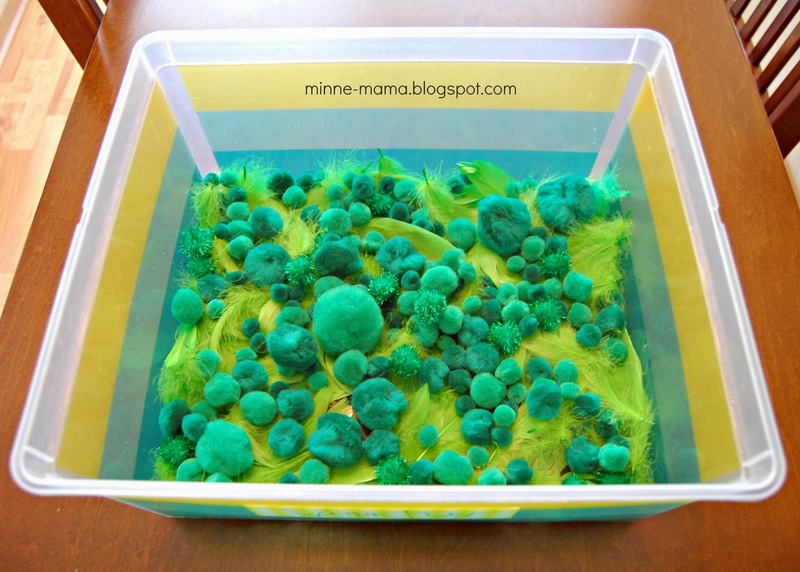 I have wanted to do both pom poms and feathers with Skyler, so I collected all of our green pom poms and bought a bag of green feathers for the base of our mostly green sensory play. 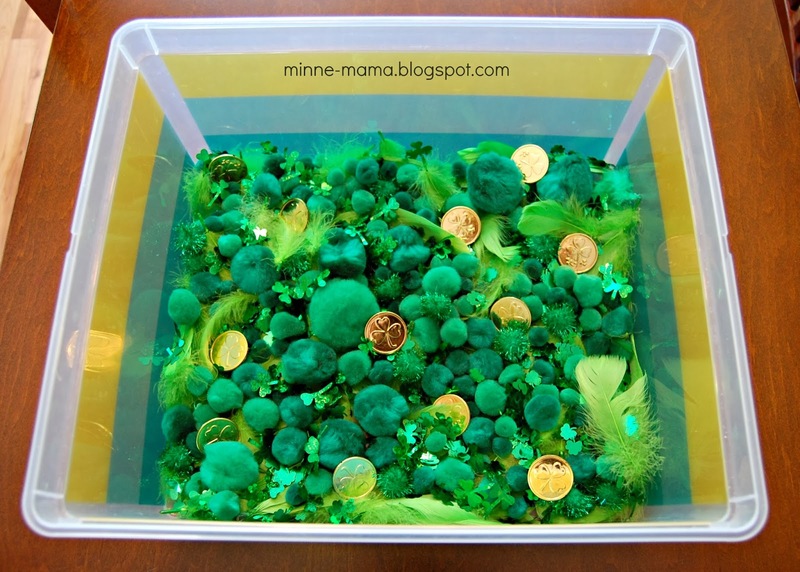 For our bin, we are also using small shamrock sequins as well as some glittery shamrocks that I cut off from a garland. 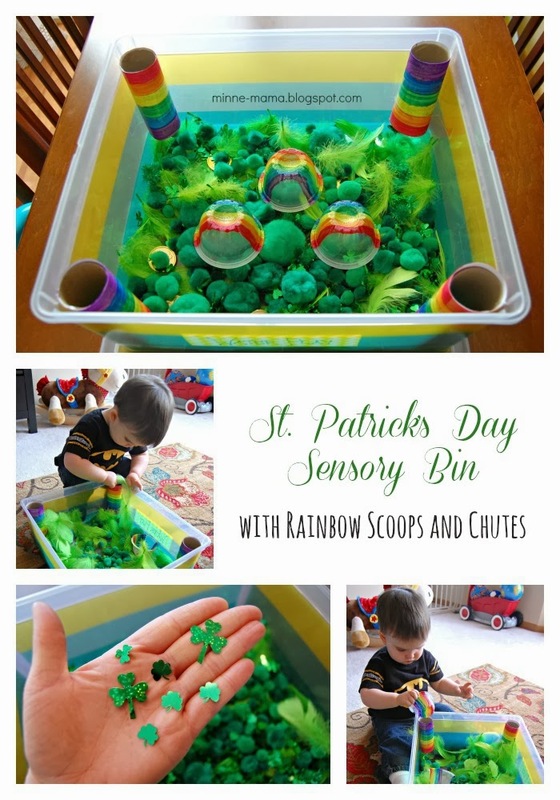 A few leftover gold coins from our St. Paddy's Day Play Dough was utilized for this bin as well, something fun to search for! 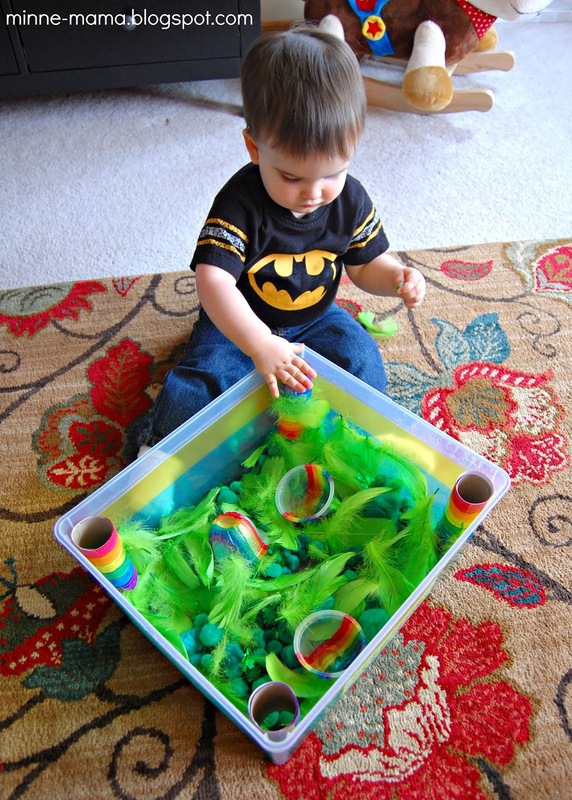 After layering all of our fillers into the bin, I wanted to add some fun accessories for Skyler to play with. 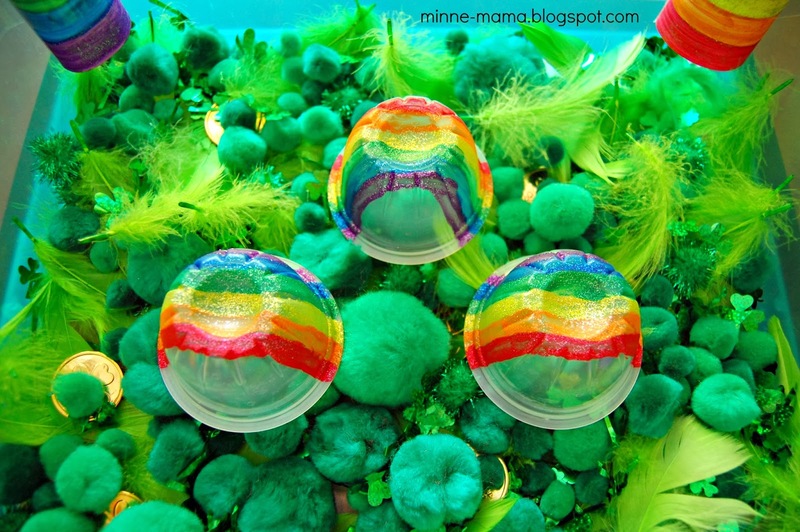 Our green and gold bin got some bright rainbow scoops and pom pom chutes. 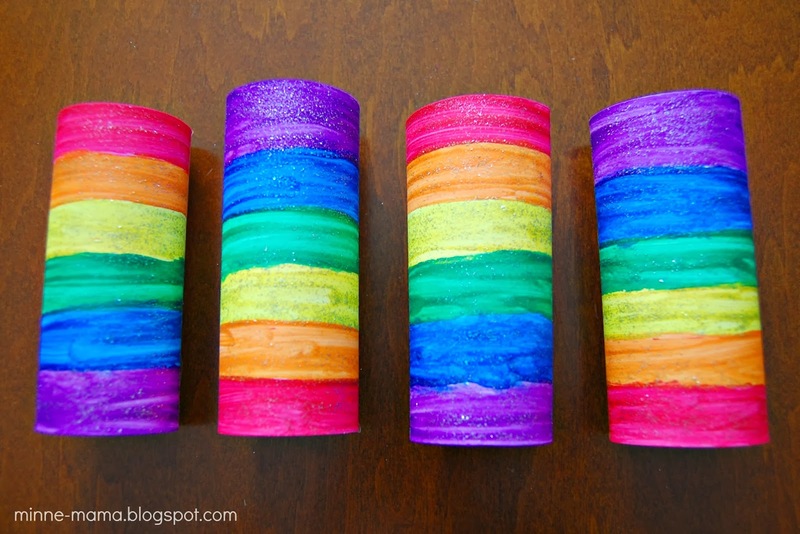 I cut some scrap paper to the size of a toilet paper roll and then painted all pieces of paper and the cups in one color before moving on to the next. This was a great excuse to use my new favorite glittery paint! 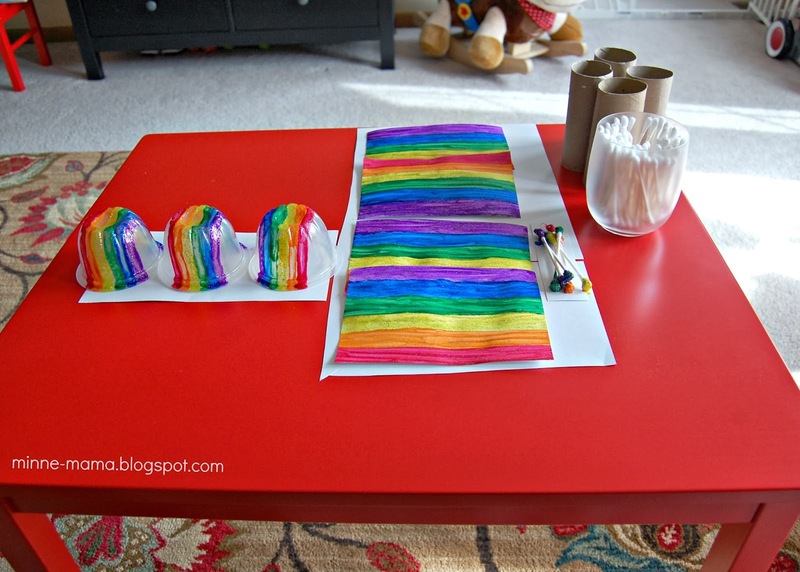 Once dry, I wrapped the toilet paper rolls in the paper and added our rainbow cups and chutes to the bin. 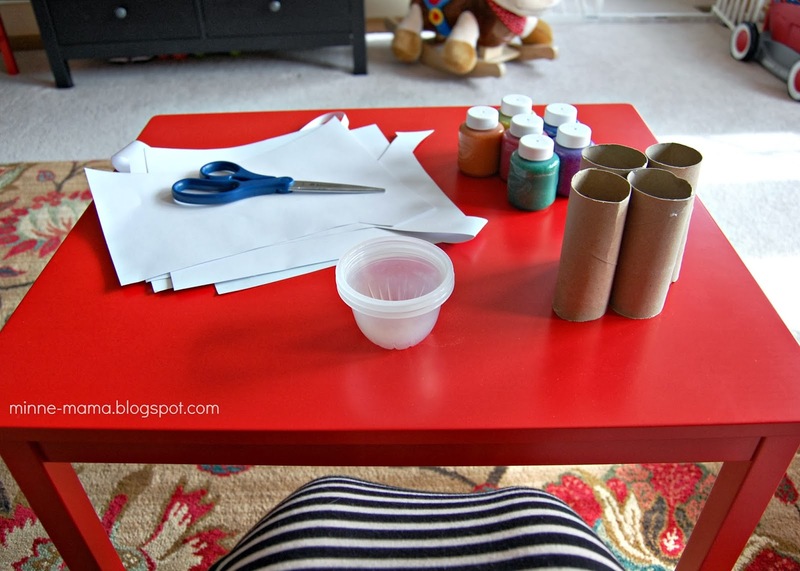 Skyler's new table makes the perfect living room craft table for me! 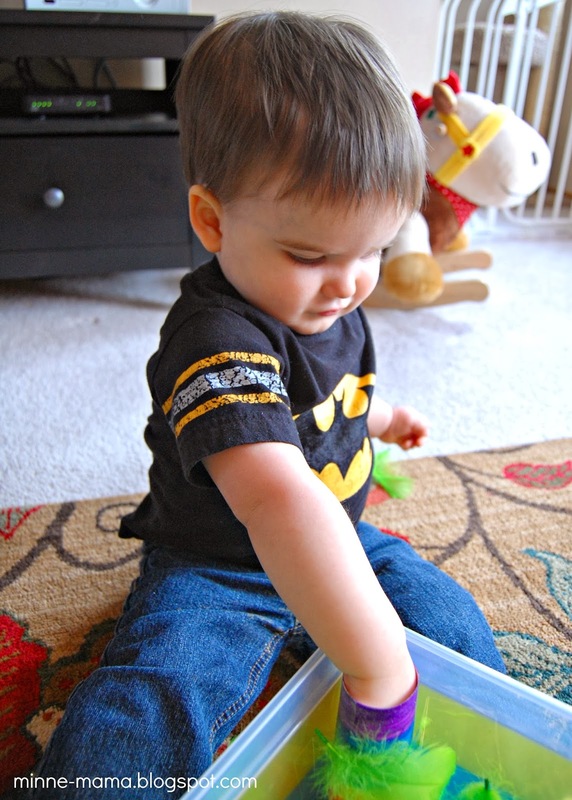 Skyler was very ready to play with this new bin, which he spied while eating a snack! 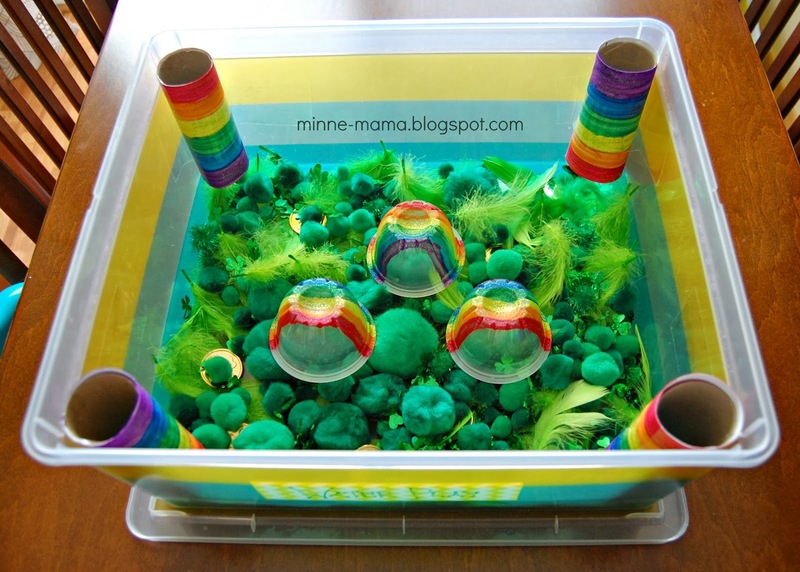 He dove right in, putting pom poms and coins down the rainbow chutes. 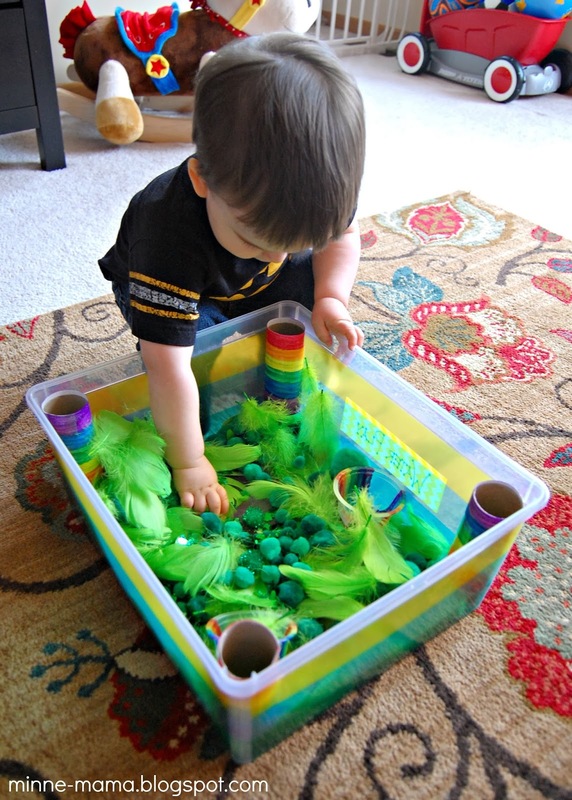 Then he was on a mission to find the gold coins, carefully separating the feathers that would stick to them, and putting them down the chutes when he got them defeathered. 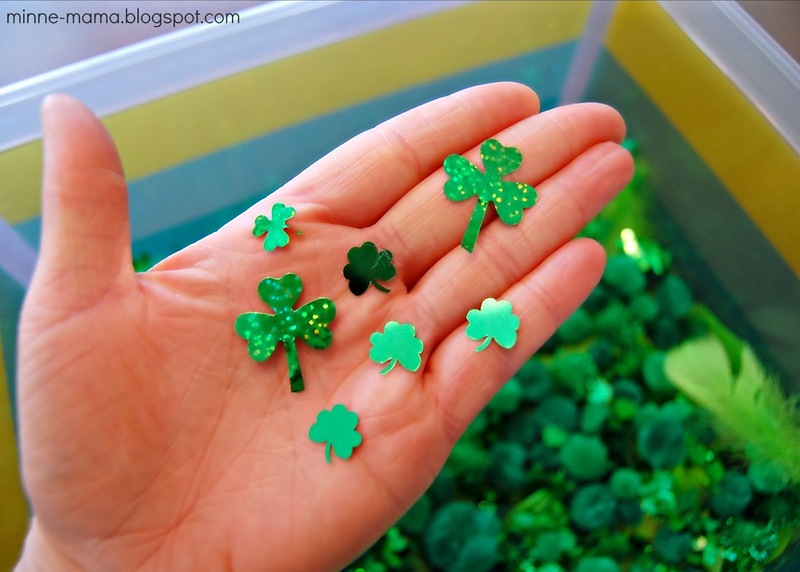 He spent a lot of time examining the different shamrock sequins. 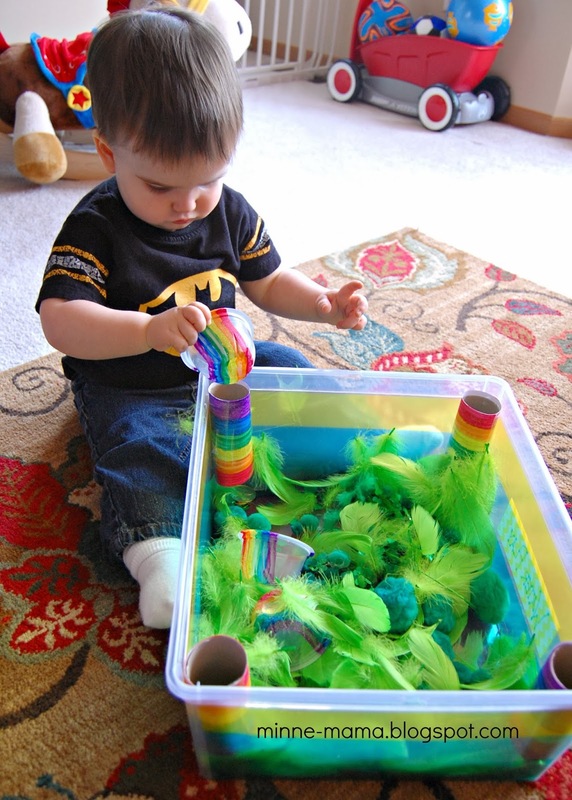 His favorite were the glittery ones from the garland. 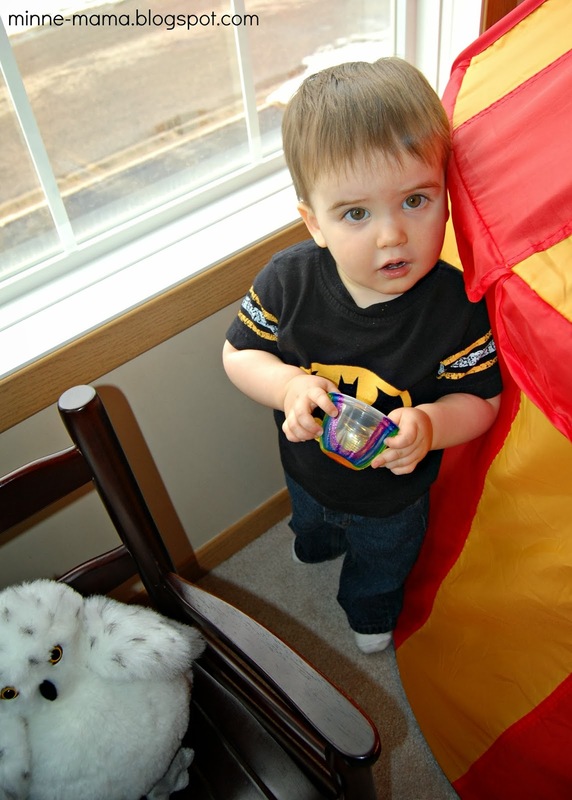 It was funny when he would put them down the chute because he wouldn't drop them in like the other pieces, he would stuff his entire hand in! 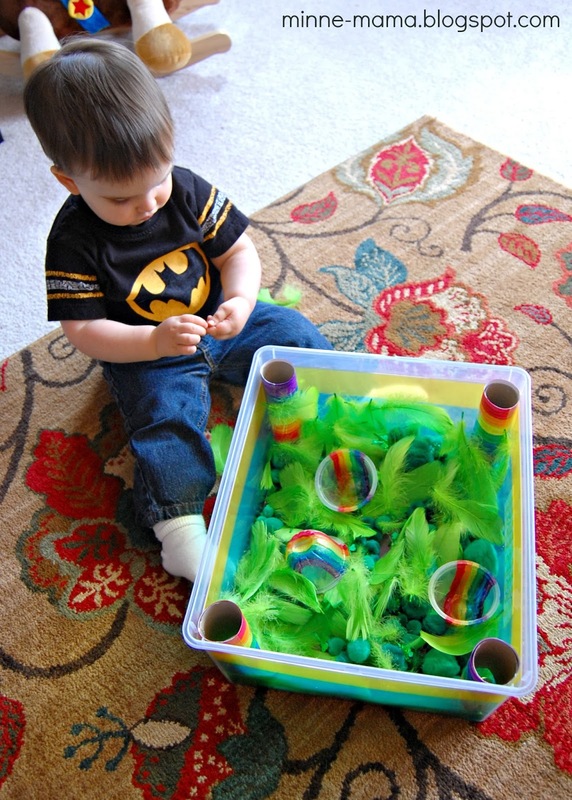 Skyler enjoyed collecting every single coin and placing them into the rainbow scoops. 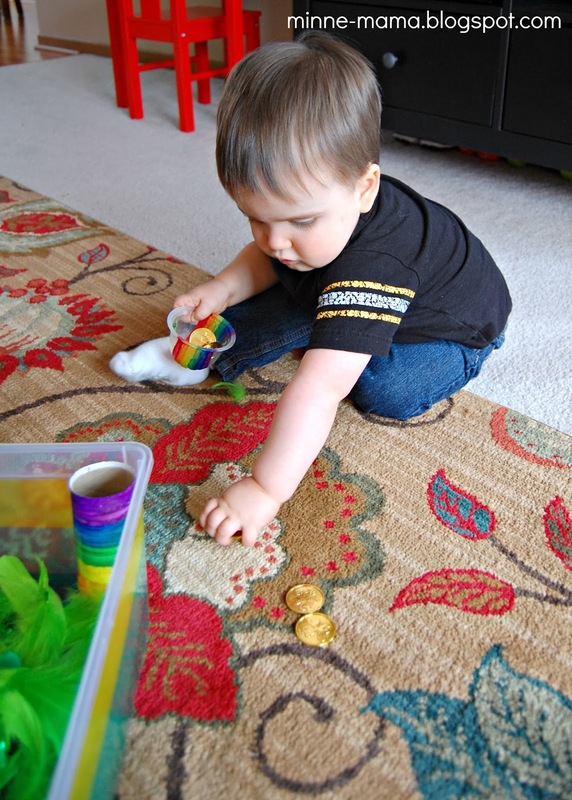 For awhile he would dump them into the chutes, but then after finding all of the coins one time, he ran behind his tent to hide with his coins, placing them all carefully on the windowsill. 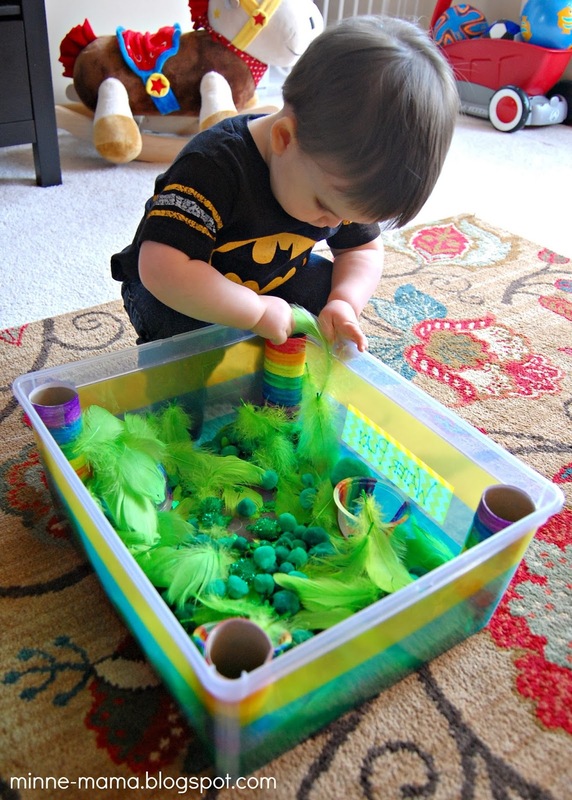 This is one of our favorite bins yet! 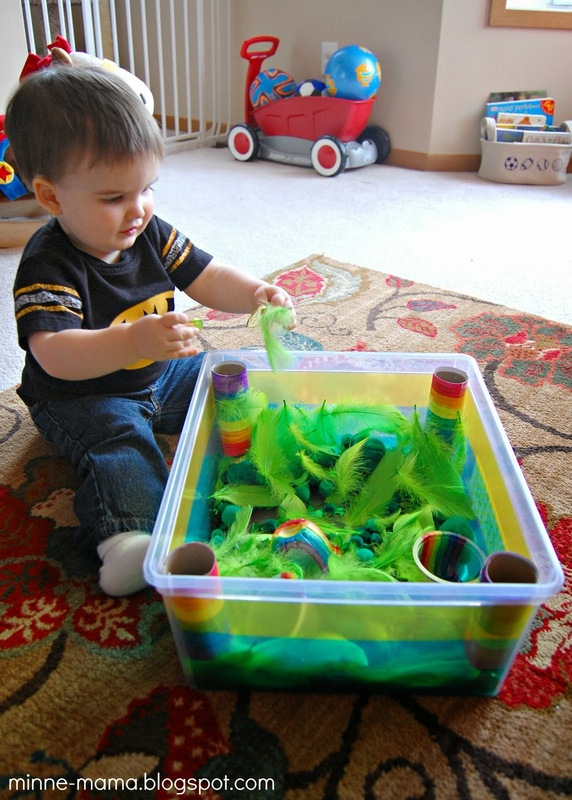 Skyler enjoyed all of the different pieces and textures in the bin and as expected, the rainbow scoops and chutes were a bit hit with my playful little one. 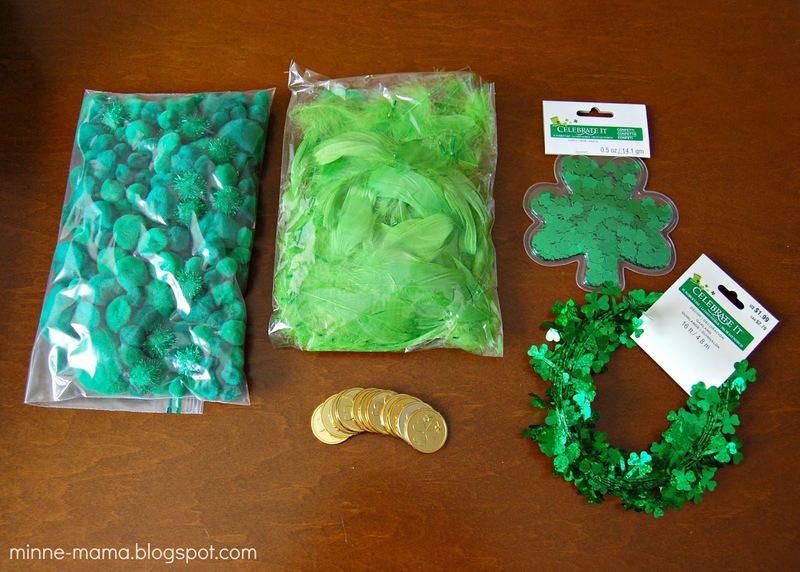 Crafting activities in the Patrick's day event seems to be a great fun. Joined my friends at one of the best Chicago venues for festive dinner recently. Table arrangements were fantastic and cuisines were way too delicious. Liked the cup cakes of different varieties. Music played was also quite soothing.